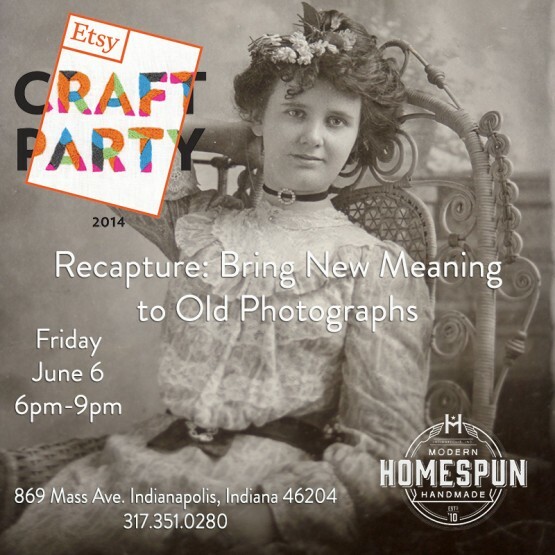 Etsy Craft Party 2014: Recapture :: bring new meaning to your photographs. Etsy Craft Party is a one-day celebration of meeting and making. This year’s theme focuses on transforming photographs into display-worthy works of art using a variety of craft supplies and creative techniques. The event is free, however registration is required. We here at homespun:modern handmade, we will be doing photo embroidery. We will have embroidery floss, needles, scissors, paper, tape and other goodies for your creating needs. Rana, our workshops coordinator will give a brief tutorial on basic embroidery stitches, so do not worry if you haven’t done this before! Be sure to bring in your own images to recreate and inspire (they do not necessarily have to be vintage images). Please note that the image you bring will be the image you stitch, so make sure its either a copy or photocopy on photo paper or card stock. Also, if you have a specific project in mind or do not wish to embroider, you are welcome to bring along your own supplies to the party.